“The fourth dimension!” The mere phrase makes some small part of my brain shiver. And it’s not just me that feels that there’s something awe-full, and maybe awful, about the fourth dimension. 16th-century scholar Gerolamo Cardano1 said it was contrary to Nature. 17th-century thinker John Wallis2 found the very idea of it monstrous. And now 21st century virtual-reality pioneers are about to bring it into your home, if you want it there. One of the most famous monsters inhabiting the fourth dimension is the tesseract, which you might have heard mentioned ever-so-briefly in the recent film “A Wrinkle in Time”. The movie is based on the classic book by Madeleine L’Engle, which has introduced generations of children to the idea of dimensions beyond the three that we see around us. A two-dimensional shadow cast by the frame of a tesseract. Also, when I say “the fourth dimension”, I’m not talking about the kind of ultra-puny (and still hypothetical) hidden extra dimensions that string theorists posit to account for the embarrassing discrepancy between the three-plus-one dimensions we can see and the eleven dimensions string theory predicts (read practically anything by physicist Brian Greene if any of this eleven-dimensions stuff is news to you). If the universe has extra directions that are rolled up the way the theory requires, then your body can’t travel in those directions; or rather, your body’s constituent particles already are zipping around in those directions, circling the universe the short way round fajillions of times per second. So what do I mean by the fourth dimension? Before I answer, let’s amend the phrase “the fourth dimension”. Why should dimensions come in some particular order? Our three-dimensional space comes with no preferred direction, and if it doesn’t look that way to you, it’s because you’re distracted by the local scenery. Out between the galaxies, one direction looks much like any other, and you and your intergalactic friends could choose three perpendicular directions to serve as coordinate axes for purposes of facilitating meetups, but there’d be no reason to single out one of the directions as the “first” direction, or the “second”, or the “third”. One of the things that gives space its spacey-wacey-ness is that all the different directions are mixed up. So instead of focussing on a particular dimension as being the “fourth”, we should focus on spaces that have (exactly) four dimensions. So what do I mean by a four-dimensional space? I mean a space that at every points admits four mutually perpendicular lines, in no particular order, but not five. Mathematicians have adopted the axiom that, just as every two-dimensional slice of Euclidean three-dimensional space obeys the laws of two-dimensional Euclidean geometry, every three-dimensional slice of Euclidean(esque) four-dimensional (hyper)space should obey the laws of three-dimensional Euclidean geometry. Once this axiom has been accepted, a host of logical consequences follow readily, even though our imaginations follow slowly, if at all. Some of these consequences should interest the practical-minded person who impatiently walked away two paragraphs back, since the mathematics of higher-dimensional spaces plays a huge role in the modern world. For instance, Google’s pagerank algorithm is based on multidimensional linear algebra. People can’t visualize million-dimensional spaces (and Google’s servers can’t visualize anything at all), but the mathematics of million-dimensional spaces is part of what makes efficient internet search possible. Just as the cube serves as the exemplar of three-dimensional space, the tesseract serves as the exemplar of four-dimensional space. The word “tesseract” was coined by mathematician Charles Howard Hinton (from an obscure Greek prefix meaning “four”). It’s more common nowadays to call the tesseract a hypercube, though the term “hypercube” is also used generically to refer to an n-dimensional cubes for any value of n bigger than 3. 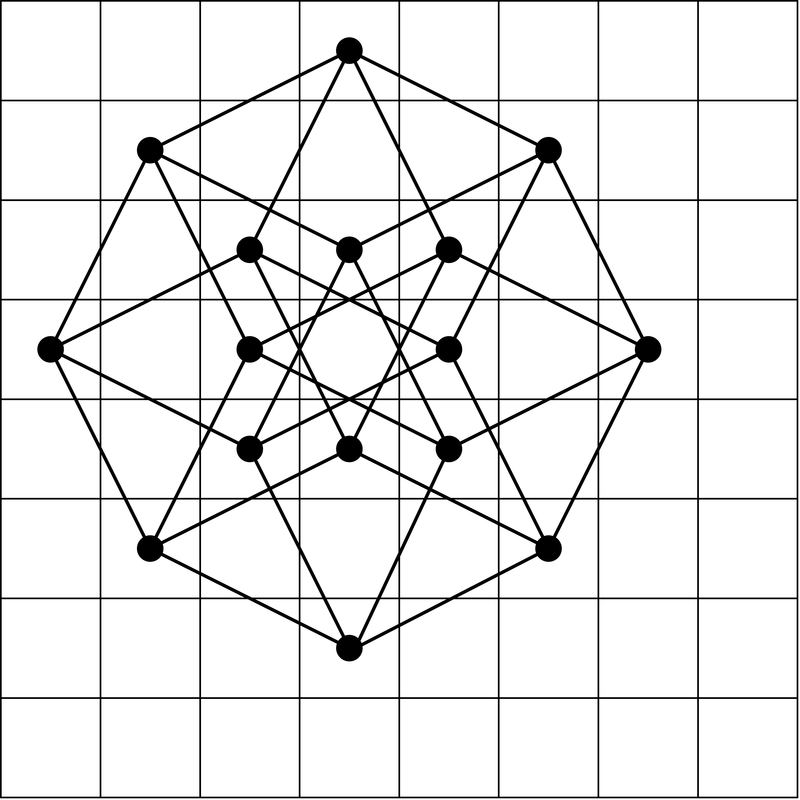 The picture shows a network of struts joining the sixteen corners of a hypercube. Here I’ve drawn the struts in red, blue, green, and orange, according to the four hyperspace directions (depicted with their mutual angles being multiples of 45 degrees, instead of all being 90 degrees as perpendicularity would require). 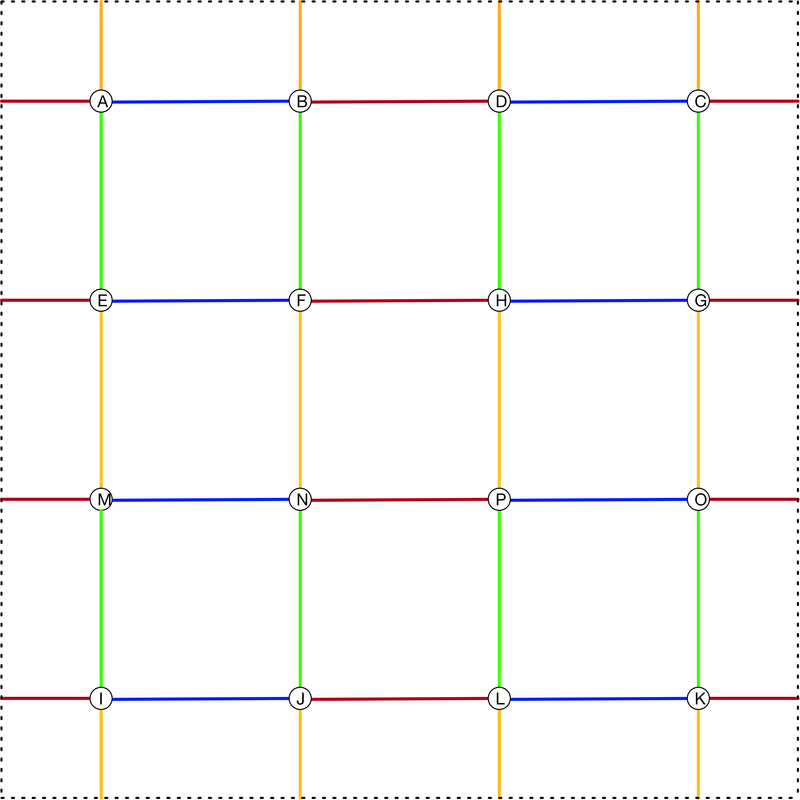 If you ignore the orange edges, you can temporarily convince your brain that the red, blue, and green struts are perpendicular to one another, forming two overlapping red-blue-green cubes. Or, if you ignore the green edges, you can convince your brain that what you’re seeing are two red-blue-orange cubes. What you can’t make your brain do is see the red-blue-green parallelepipeds as being cubes and see the red-blue-orange parallelepipeds as being cubes at the same time — let alone do the same for the other two ways of attending to just three of the four colors. The use of two-dimensional pictures as cartoons of the tesseract is reminiscent of the way 20th century artists like Picasso sought, in the Cubist movement, to create two-dimensional images incorporating multiple incompatible perspectives. Obtaining a four-dimensional view is thus a matter combining three-dimensional views that in our world are irreconcilable. If we cease from this struggle and just accept irreconcilability, we switch over to a less ambitious two-dimensional perspective, and then those would-be cubes are seen as perfectly compatible parallelepipeds. Notice that, as in the earlier colored picture, there are sixteen dots, and each of them is joined to its neighbors by four differently-colored struts. To turn it into a hypercube, you’ll have to make some modifications of this picture, or, as L’Engle might have said, you’ll have to “wrinkle” it. 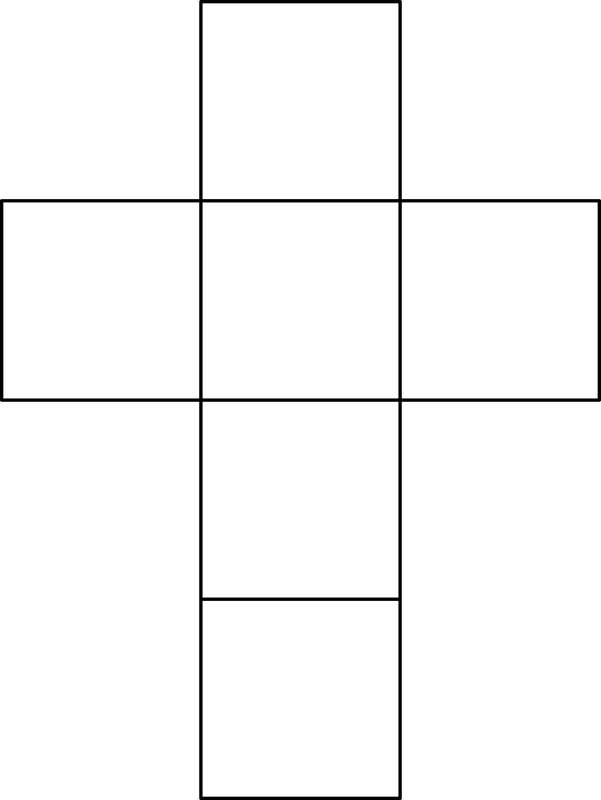 First, print it out (if you’re reading this on a screen) and then cut it out along the dotted lines, obtaining a square. Now join the top edge to the bottom edge, obtaining a cylinder, and then join the left edge (which is now a circle) to the right edge (also a circle). What? You were able to do the first step, but not the second? Sorry, my mistake. Go back to the flat square, join the left edge to the right edge, obtaining a cylinder, and then join the top edge (which is now a circle) to the bottom edge (also a circle). What? You still couldn’t do both steps? Even though you were able to do each of them separately? Oops, I forgot to tell you: to do the joining properly, without distortion, you’d need to use the fourth dimension. Since we live in a three-dimensional world, you’ll have to tolerate some distortion. Replace the piece of paper by something as stretchy as bubble gum; then you can fold up the square to forum a torus (the surface of a doughnut). The vertices A, B, C and D will form the vertices of a square, and so will the vertices A, E, I, and M.
Cartoon by Ben Orlin. Check out @mathwithbaddrawings on Twitter. This looks like a little cube inside a big cube, but we’re invited to conceive of the little cube as being the same size as the big cube — it only looks smaller because it’s farther away from us in the fourth dimension. This picture was very common when I was young, but I always found it confusing, because it seemed wrong to apply perspective principles to the fourth dimension but then not apply them (or only apply them minimally) to the other three. But I think it’s the best picture to use if you want to try to count all the edges (can you find all 32?) and all the faces (can you find all 24?). If you cut away 4 of those faces (the ones that intersect the line running through Ben Orlin’s “handle”), you can see the torus I mentioned a little while ago. Here I’ve drawn some of the edges as dashed lines, to suggest the edges of the cube that aren’t visible because they’re obscured by other bits of the cube. 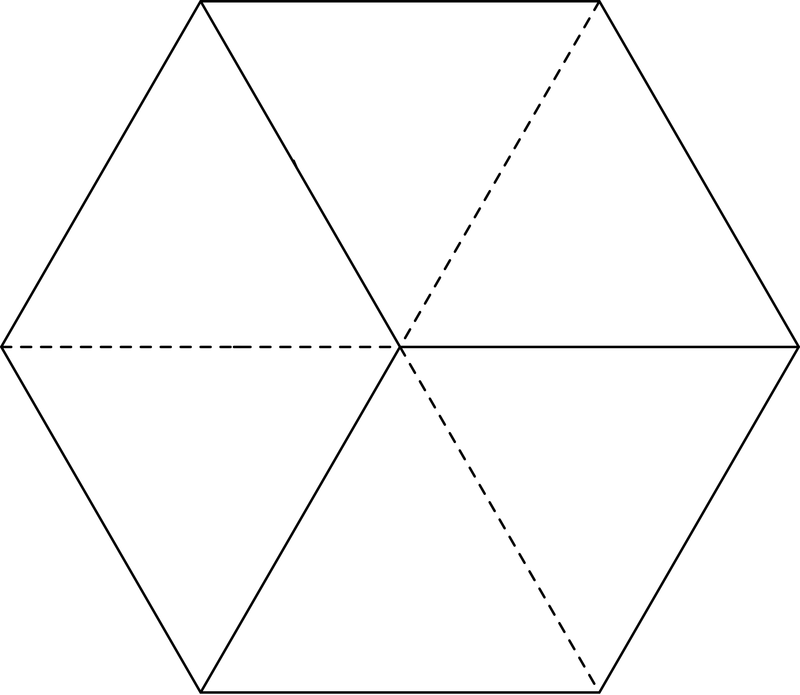 The middle of the hexagon is simultaneously a projection of the cube’s front vertex and back vertex. 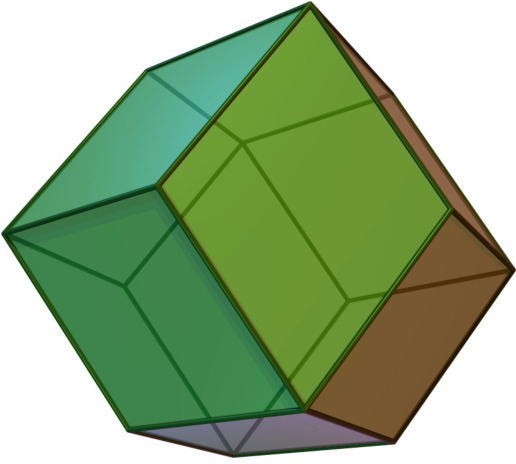 In the same way, the extra vertex that we added in the middle of the rhombic dodecahedron is simultaneously the projection of the hypercube’s front vertex and back vertex, in the fourth dimension. The four not-really-perpendicular axes here are the four diagonals of a cube, which are mutually at 60 degree angles. The rhombic dodecahedron offered us an orthographic projection of a hypercube (parallel lines stay parallel), and the little-cube-in-a-big-cube picture offered us a central projection (some parallel lines appear to meet). Yet another way of projecting four-dimensional space into three-dimensional space is stereographic projection. With this sort of projection, the edges of the hypercube become circular arcs. Later on I’ll show you the wonderful use that mathematician and artist Henry Segerman makes of this style of projection. Unfolded hypercube, from Davide Cervone’s website on the fourth dimension. 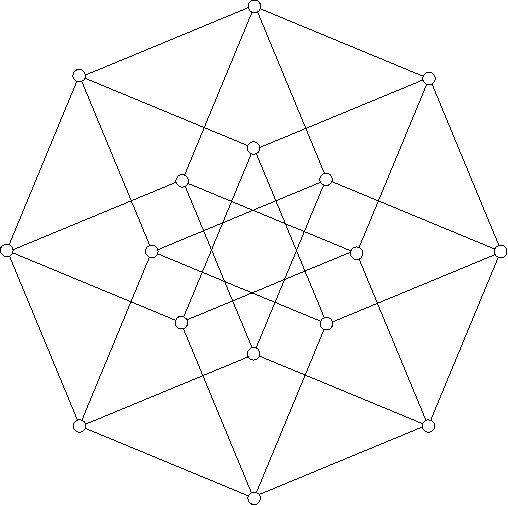 If we ignore sharps and flats, those thirty-two notes can be seen as a plane projection of a five-dimensional “parallelotope”. Elkies has shown me other examples of four- and five-dimensional cubes in classical music, and fugues are especially abundant sources, but in most instances the time-delay between themes and repetitions obscures the geometric structure of the passage. Also, many of the examples involve some fudging with the sharps and flats. Can any readers point me toward other examples of hypercubes, perhaps in 20th century music? The whole project of serial music seems like it would be well-suited to such experiments. One way to get a feeling for an abstract mathematical structure is to play with it. 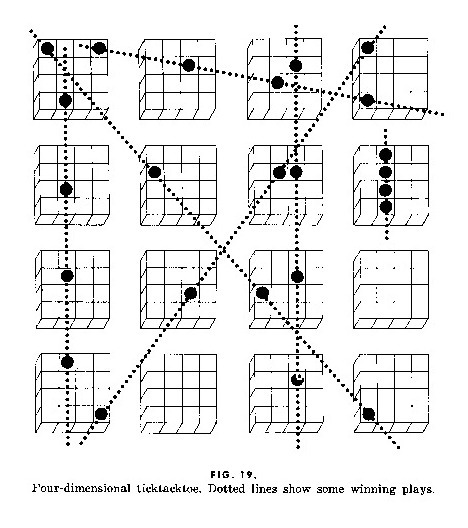 As a teenager, I convinced many of my friends to play four-dimensional tic-tac-toe, which I learned about from a Martin Gardner column, reprinted in “Hexaflexagons and Other Mathematical Diversions”. From “Ticktacktoe” (chapter 4 in “Hexaflexagons and Other Mathematical Diversions” by Martin Gardner); permission pending. Nowadays I suspect many children have their first four-dimensional experience playing Marsha Falco’s game Set, whose 81 cards can be viewed as the points in a 3-by-3-by-3-by-3 grid whose four “dimensions” are color, number, shading, and shape. Sometimes a puzzle has a hidden four-dimensional aspect. The famous Tower of Hanoi puzzle, with n disks on three pegs, turns out to be equivalent to the problem of constructing a Hamiltonian path on an n-dimensional hypercube. (See chapter 6, “The Icosian Game and the Tower of Hanoi”, in “Hexaflexagons and Other Mathematical Diversions”.) 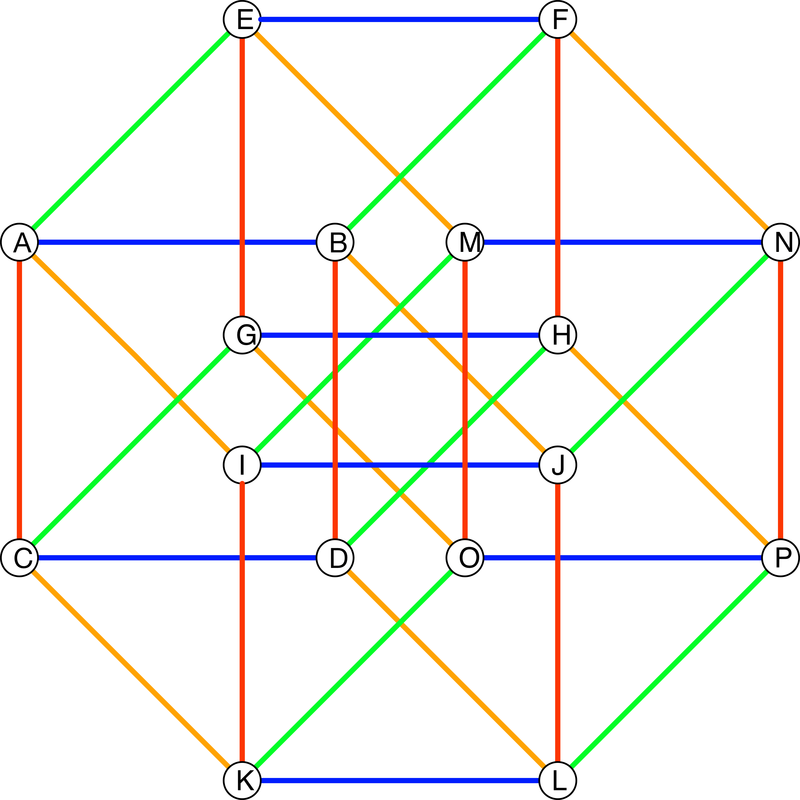 So if you’ve ever solved the 4-disk version of the Tower of Hanoi, you’ve been effectively traveling on the surface of a tesseract, whether or not you were thinking about it that way. Another puzzle that has a hidden four-dimensional aspect is one that Martin Gardner learned about from Scott Kim (which I in turn learned about from reading Gardner): Can you place sixteen knights on a chessboard so that each of them attacks exactly four others? See Endnote 4 for the solution. In some ways, it’s silly to try to learn about the fourth dimension from two-dimensional still images or even from three-dimensional static objects. After all, the way we learn about our three-dimensional world is by seeing how its appearance changes when we move through it. So it’s natural to use time as a tool for understanding the behavior of a (spatial) fourth dimension. Mathematician Tom Banchoff has been a pioneer of using computer animation to make the fourth dimension accessible, and his classic video “The Hypercube: Projections and Slicing” is worth watching. It’s natural to model the sixteen vertices of the hypercube as the sixteen points (a,b,c,d), where I’m using quadruples to represent points in the usual “Cartesian coordinates” way (but with four dimensions instead of just two or three), and where each of the numbers a, b, c, d is either 0 or 1. This is the point of view lurking beneath the surface of Federico Ardila’s video, listed in the References. A different model uses the coordinates −1 and +1 instead of 0 and 1. Then the sixteen points all lie on the hypersphere given by the equation w2+x2+y2+z2=4, and instead of joining them up by line segments, we can join them up by circular arcs that lie on the hypersphere. If we then take these 16 points and 32 arcs and stereographically project them from the hypersphere to ordinary three-dimensional space, we get a tesseract with curved edges. This more organic-looking kind of tesseract is the basis of Henry Segerman’s hypercube zoetrope, which wittily marries 19th century proto-cinematic technology with 21st century object-fabrication technology. You can see it featured in the video Brilliant Geometry: a physical 3D zoetrope of a 4D cube (starting about 9 minutes and 30 seconds in). But passive viewing of a dynamically changing image, however rich that image might be, is still only a crude imitation of the way babies achieve fluent understanding of the geometry of the physical world, and convert the “blooming, buzzing confusion” of sense-data into a three-dimensional mental map. Would a baby with its hands and legs bound (warning: don’t try this at home! ), watching the world through the gaps in its crib, ever learn to make sense of space? Of course not! And yet, when it comes to the fourth dimension, we’re that baby. Or we were, until computer-generated reality came into the story. We can now learn about the 4D world by moving through it and interacting with it. For instance, check out Jeff Weeks’ 4-d games (4D Maze, 4D Draw) that you can play with on your smartphone. One way to get a feeling for high-dimensional objects in four dimensions and beyond is to take a “walk” around them and survey them from multiple angles. If this interests you, you might want to play with Ggobi (pronounced “gee-gobi”), a statistical visualization package that includes as one of its methods the ability to take a “grand tour” of a high-dimensional object. Visit http://www.ggobi.org/ (the grand tour is is described in section 5.4 of the manual). Tom Banchoff told me about the work of Marc ten Bosch (http://marctenbosch.com/). I’d already played with Marc’s 4D Toys app on my smartphone, but I never got a good feeling for it. (The blurb calls 4D Toys “a box of toys from the fourth dimension. It turns out the rules of how objects bounce, slide, fall, spin and roll around can be generalized to any number of dimensions, and this toy lets you experience what that would look like.” There’s a short video about it.) Marc’s other project, Miegakure, a platform game that integrates exploring the fourth dimension with solving puzzles, was totally unknown to me. You can get a feel for the game by watching the video “Designing a 4D World: The Technology behind Miegakure”. If any of you have experience with the game, please post a comment! Henry Segerman told me about a game called “hypernom” that he and others have developed, best played on an iOS or Android device, available at http://hypernom.com. By rotating your device around, you can move through a tiling of the three-sphere, eating the cells of your choice of 4D polytope. More details are at http://elevr.com/hypernom/. With the advent of virtual reality, a long-deferred part of Hinton’s dream can finally be realized. In thinking about how one might come to understand the fourth dimension, Hinton realized that children might have more luck than their parents, since the youthful brain is more malleable; he also realized that in some ways humans don’t get to develop three-dimensional intuition the way birds and fish do, since unlike creatures of the air and the sea, we mostly move in two dimensions. He therefore made a point of creating climbing structures for his young children, and devising games that could be played on those structures, with the goal of enhancing the children’s appreciation of three dimensions. One of those children, Sebastian Hinton, went on to develop the idea and patented what today we call the “jungle gym”. Nowadays we view climbing jungle gyms as just a form of physical recreation, but Hinton would have seen it as a way of learning about three-dimensional space, and a prologue to a new chapter in the awakening of the human species to consciousness of higher dimensions. He would have loved the sort of ropy and foamy geometrical structures kids get to climb on nowadays, and probably would have invented games for kids to play on those structures, as a prod toward internalizing three-dimensional geometry. But still, those are three-dimensional structures. Now, thanks to virtual reality, we can give our children experiences conducive to internalizing four-dimensional geometry. It will be interesting to see what happens next. Thanks to Tom Banchoff, Edwin Clark, Noam Elkies, David Feldman, Sandi Gubin, George Hart, Scott Kim, Evelyn Lamb, Mike Lawler, Jeannine Mosely, Gerry Myerson, and Henry Segerman. Next month: Why does “Exploding Dots” work? #3. It’s interesting to zoom in on the transaction that occurs when, by accepting an axiom about four-dimensional spaces, the mind gets a kind of theoretical purchase on concepts that cannot be directly imagined with any kind of vividness. As Bertrand Russell wrote (in his review of Hinton’s book “The Fourth Dimension”): “[I]f such purely intellectual constructions as the fourth dimension are to be permissible, it is surely necessary to emancipate our logic from the degrading dependence on perceptible space to which Kant condemned it.” And yet, the relationship between physical experience on the one hand, and the mathematical idea of a fourth dimension on the other hand, is a subtle one. Certainly the existence of a fourth dimension is contradicted by experience in our every waking moment. And yet, the idea of the possibility of a fourth dimension is obtained by combining physical experience with the non-physical idea of extrapolation and analogy. Would any philosophers reading this essay care to comment on whether Russell is being fair to Kant in this passage? Edwin A. Abbott, Flatland: A Romance of Many Dimensions, 1884. Federico Ardila, “Combinatorics and higher dimensions” (video). This video inspired Mike Lawler to make a video about showing Ardila’s video to his kids. John Baez, “Symmetry and the Fourth Dimension”. For purposes of this essay, you might want to start with Part 11 and Part 12. Thomas Banchoff, “History of Thought: Four-Dimensional Geometry”. Davide Cervone, “Beyond the Third Dimension” (virtual exhibition available in Portuguese and English). Davide Cervone, “Some Notes on the Fourth Dimension” (a collection of materials Cervone put together for a course on the fourth dimension described in the Union College newsletter). David Darling and Agnijo Banerjee, “Weird Math” (see chapter 2, “How to See in 4-D”). Martin Gardner, Hexaflexagons and Other Mathematical Diversions. See chapter 4 (“Ticktacktoe”) and chapter 6 (“The Icosian Game and the Tower of Hanoi”). Martin Gardner ,Mathematical Carnival. See chapter 4 (“Hypercubes”). Kelsey Houston-Edwards, Dissecting Hypercubes with Pascal’s Triangle (video, PBS Infinite Series). This video inspired Mike Lawler to make a video about showing Houston-Edwards’ video to his kids. Mike Lawler, HyperCubeB (video). This walk-around of a model of Bathsheba Grossman’s version of the tesseract is downright spooky; it sure looks like the thing is changing, even though the only thing that’s changing is our perspective! Mike and his kids made two videos about this: one in October of 2016 and the other a couple of weeks later. Madeleine L’Engle, A Wrinkle in Time, 1962. Matt Parker, Things to Make and Do in the Fourth Dimension. Matt Parker, Four Dimensional Maths: Things to See and Hear in the Fourth Dimension (video). Rudy Rucker, Geometry, Relativity and the Fourth Dimension. Bertrand Russell’s review of Hinton’s book The Fourth Dimension. Hannah Fry and Thomas Rutherford, “The Fifth Dimension” (podcast). Jody Trout, “History of the Fourth Dimension” (PowerPoint presentation). This entry was posted in Uncategorized on May 16, 2018 by jamespropp. I must be missing the point of the square you can join left to right, or top to bottom, but not both. You don’t have to go to the 4th dimension to make both joins – you just have to make the whole thing out of rubber instead of paper, and you get a donut, in three dimensions. Does that help me visualize the tesseract? I don’t think you are missing the point at all; I was just being too narrow. (Sometime I’ll edit the paragraph to say something like “For the price of some geometric distortion, we can replace paper by rubber, and then the sixteen points become …”) Notice that the four-colored octagonal depiction of the hypercube can be seen as a transparent polyhedral torus, as can the little-cube-in-a-big-cube picture.